Paging, sorting and filtering are common features in websites. Microsoft has written a tutorial how to implement these features in ASP.NET Core MVC with Entity Framework Core. The described solution works but I found it a bit too primitive. It triggered me to create a more powerful solution. Before you can start using my solution you should first read this tutorial, it explains how you can add Entity Framework Core to an ASP.NET Core MVC application. I have just received mail from Pearson VUE informing me that have passed the Beta Exam 70-528 TS: Microsoft .NET Framework 2.0 - Web-Based Client Development (called 71-528 while it's in Beta). I also received a free Voucher for a next exam, thanks guys. On Friday I will try the Beta Exam 70-551 UPGRADE: MCAD Skills to MCPD Web Developer by Using the Microsoft .NET Framework. One week later I will try the Beta Exam70-552 UPGRADE: MCAD Skills to MCPD Windows Developer by Using the Microsoft .NET Framework . Wish me luck. Microsoft has put my 'Dual List' .NET Magazine article online! Microsoft has put my Visueel programmeren met .NET: Dual List Control article online. It is published in the .NET Magazine #8 and it is free for Dutch developers. They didn't publish the sourcecode (yet) but you can download it from my own site. The aricle is in Dutch. You can find an (old) English version of this article here. An even more advanced implementation that also supports Drag & Drop can be found here. For a long time I thought that I only had to set the Cursor.Current to a WaitCursor before a long running operation, the .NET runtime would reset it back to the Default cursor. Turns out that this is only true when the mouse is moved. Bummer. // mouse is moved and the application is idle! The solution for this problem is very easy. I created a helper class called WaitCursor which set the Cursor.Current and restores it to the original value when it it disposed. I create the instance of the WairCursor class inside a using statement. This will automatically call the Dispose() method when it goes out of scope. There is a difference in disposing Modal and Non-Modal forms. In a training I gave last week I noticed that even experienced developers didn't know that Modal Dialogs don't dispose automatically, Non-Modal do. The solution to this problem is very simple by creating the Form instance within a using block. This will dispose the Form when it is closed. An alternative solution uses a try/finnaly. Personally I prefer the previous, it is easier to read and write. 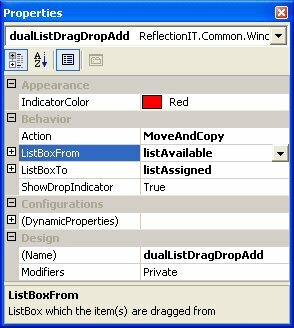 I have written an article two years ago with the title 'WinForm DualList Component'. In this article I mentioned the desire to extend the DualList component with Drag & Drop support. Finally it's done. Not by extending the original DualList component but by creating an new DualListDragDrop component (reason: cohesion). Programming Drag & Drop (D&D) between listboxes is quite difficult. It requires at least 60 lines of code for every two listboxes. Therefore not many application support D&D. This component eliminates need of writing the code. You only have to set properties on it. Making it easy to support D&D in your applications. 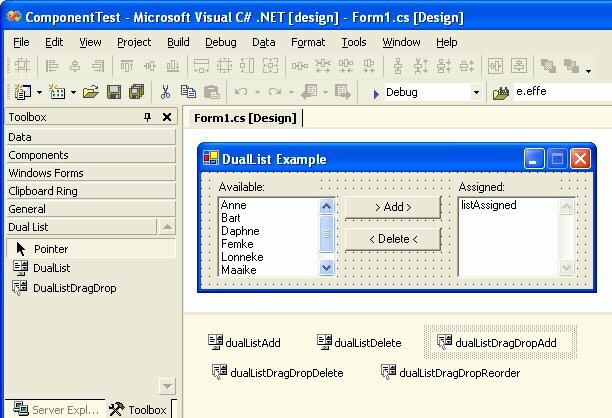 The DualListDragDrop component is a component which can be dropped in the 'component tray' of a windows Form. You therefore first have to add it to the Toolbox of Visual Studio.NET. This can easily be done by dragging ReflectionITWinFormComponents.dll assembly from an normal Windows Explorer and dropping it on the Toolbox. All controls and components from the assembly will be added to the Toolbox. You can create an separate Tab for it if you want. For each D&D direction you must add DualListDragDrop component to you Form. In this example three. 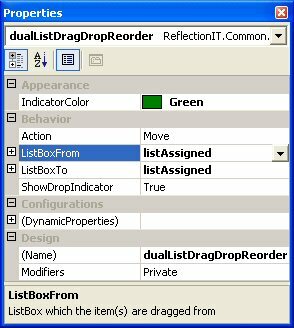 For each component you have to set the '(Name)', 'ListBoxFrom' and 'ListBoxTo' properties. You can use the DualListDragDrop component to reorder the position of the items in a ListBox by selecting the same 'From' and 'To' ListBox. You can choose from three values for the Action property: Move, Copy and MoveAndCopy. The MoveAndCopy will normally move an item. You can copy the item by pressing the Ctrlkey while initiating the D&D operation. The DropIndicator can be set to 'True' which means you will get a red dotted line indicating where the item will be placed when you drop the item. It supports scrolling the listbox up and down when you move your mouse over the first or last visible item. The item will be added to the bottom of the list when the property is set to 'False'. The color of the line can be selected using the IndicatorColor property. The DualList and DualListDragDrop components are easy solutions for difficult features. It takes care of all logic needed to move and or copy items from one listbox to another. Use them in your own applications, they are free. Hopefully this article will encourage more people to make use of the component architecture in their own applications. The ReflectionITWinFormComponents assembly is free for use in commercial or private applications. However, you may only redistribute this in its compiled form (modified or unmodified), you may not redistribute the source or modified source. When using it, please include the line "ReflectionITWinFormComponents - Copyright Reflection IT - http://www.reflectionit.nl/" reference in either the about or in the documentation. This will help me out and allow me to continue to provide you with free controls. I have found a solution for a problem which I had for a long time. I was unable to set the ToolboxBitmap attribute for a component using the (type, string) constructor. I found the solution for this problem (using an internal ResFinder class) on www.bobpowell.net. This site has also some other Windows Forms Tips and Tricks. Great! This table gives you an overview of all collections in the System.Collections and System.Collections.Specialized namespaces. System.Array ? Predefined size, used for passing data around. ArrayList Object Easy to work with, provides basic collection functionality and can easily be converted to an Array. CollectionBase ? Abstract base for building your own collection classes. DictionaryBase Object ? Abstract base for building your own collection classes using a key-value pair. HashTable Object Object Provides high performance access to items in the key-value pair collection, by a specific key. Queue Object Implements the FIFO mechanism. ReadOnlyCollectionBase Object Abstract base for building your own read-only collection classes. SortedList Object (sorted) Object Provides access to items in the collection by a specific key or an index (GetByIndex(int)). Stack Object Implements the LIFO mechanism. Object Object Uses internally a ListDictionary class when the collection is small, and switches automatically to a Hashtable class when the collection gets large. Specialized.ListDictionary Object Object Is designed to be used for collections with 10 or less items, while the Hashtable is designed to contain more items. Specialized.NameObjectCollectionBase String ? Abstract base for building your own collection classes using a key-value pair. Specialized.NameValueCollection String (sorted) String NameValueCollection class is the strong type equivalent of the SortedList class, for the String class. Specialized.StringCollection Object Strongly typed ArrayList for the String class. Specialized.StringDictionary String String Strongly typed Hashtable for the String class, not sorted. Read also Jan Tielens article on the MSDN Belux website. I have used the EventsHelper class to fire events asynchronical. I came across this class in the TechEd 2003 presentation C# Best Practices from Eric Gunnerson and Juval Löwy. Today I noticed a bug. The FireAsync() method uses the 'Fire and Forget' pattern incorrectly. The 'Fire and Forget' pattern is used when the return value and returned parameters of the call are not required, and when there is no need to synchronize with the asynchronously executing method. In this case, the caller simply needs to call BeginInvoke, passing any normal and ref parameters, and null for the callback and asyncState. This has been a commonly used pattern. However, there has been a documentation change in version 1.1 of the .NET Framework that has big ramifications for this technique of making async calls. The documentation now states that EndInvoke must be called for a corresponding BeginInvoke--otherwise Microsoft say they may now, or in the future, leak resources. It appears that no resources are leaked under version 1.0 of the framework; however, with this type of warning in place, it is recommended that a call to EndInvoke be made even if the return values of an async call are not required. It is relatively straightforward to create a helper class that handles this for you--one example I found here. I have written the following DateDiff() function in C#. VB.NET users already had it using the Micrsoft.VisualBasic.dll assembly. Now you can use it without referencing this 'ugly' extra assembly.